The Federation of Indian Chambers of Commerce & Industry (FICCI), in association with Services Export Promotion Council (SEPC), All India Council for Technical Education (AICTE), Ministry of Human Resources Development (MHRD), and Ministry of Commerce and Industry hosted the 13th Higher Education Summit from Nov 9-11, at the India Exposition Centre, Greater Noida, Delhi NCR. The conference witnessed focused deliberations on policy roadmap and other topical issues in Higher Education; Master Classes on issues pertinent to the sector; poster presentations; global exhibitions by academia and industry alike and FICCI Higher Education excellence awards. 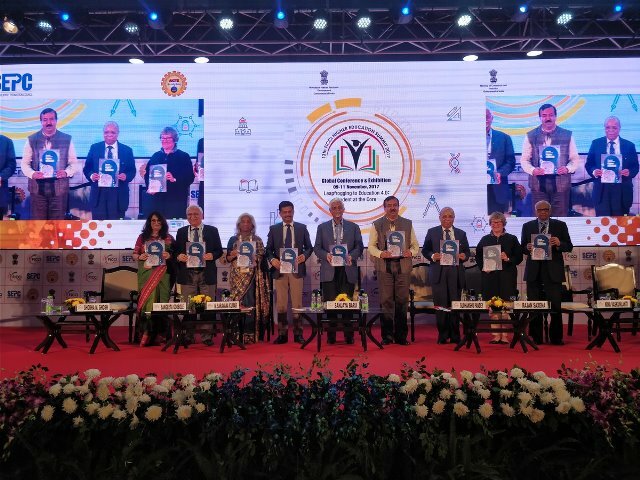 The inaugural session at the summit witnesses representations from the Ministry of Human Resources Development (MHRD), FICCI Higher Education Committee, Ministry of Commerce and Industry and other stalwarts from the field of higher education. The session also saw the release of two knowledge papers: Leapfrogging to Education 4.0: Students at the core ( a FICCI & EY publication), and ‘Social Outreach in Higher Education’ (drafted by the FICCI Taskforce on Social Outreach in Higher Education, chaired by UNESCO Co-Chair, Dr Rajesh Tandon). The UNESCO Chair anchored two key sessions at the summit, namely: Diversity and Social Inclusion and Social Outreach in Higher Education. The session on ‘Diversity and Social Inclusion’ shared innovative approaches at policy, procedure and implementation levels for enabling inclusion and strengthening diversity of students, faculty and staff. The keynote for the first was given by UNESCO Co-Chair, Dr Budd Hall, while the session was moderated by Dr Rajesh Tandon, UNESCO Co-Chair & Founder-President, PRIA. Other speakers in this session include Dr Darren Brendan Lortan, Director, Community Engagement, Durban University of Technology & Dr Usha Iyer-Raniga, Associate Professor, Deputy Head, International, RMIT, Melbourne. The session on ‘Social Outreach in Higher Education’ focused on deliberations on how University 4.0 should emphasize ‘education’ & ‘educative practice’ in ways which make them socially relevant and responsible. This keynote for this session will be given by Dr Abd’ Ala, Rector, UIN Sunam Ampel University, Indonesia; while the session will be moderated by Dr Rajesh Tandon, Co-Chair, UNESCO Chair & Founder-President, PRIA. Other speakers in this session include Prof Andrea Vargiu, Associate Professor, Department of Human & Social Sciences University of Sassari and Ms. Phinu Jose, Director, Centre for Social Action, Christ University, Bengaluru.